Allegra Boverman/Gloucester Daily Times. 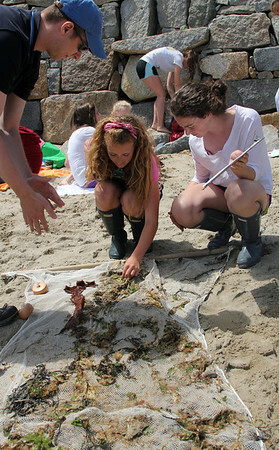 Rockport Middle School eighth graders Isabel Gleckner and Carly Guelli examine a sampling of seaweed and other items pulled out of the water at Front Beach using a seine net during their two-day long research project there and Millbrook Meadow earlier this week with NOAA scientists. Brian Hooper of NOAA talks with them about what they're looking at.